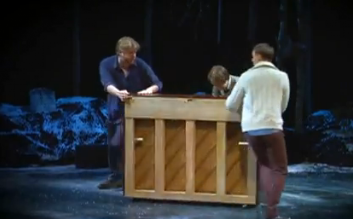 Bloggery media rep DanDan swung by the Loeb Drama Center to check out Three Pianos. Here's what he had to say. Before talking about Three Pianos, I should give the caveat that I am, by no means, a person who knows anything about classical music. With this in mind, I made sure to grab a music major friend of mine when I heard that Three Pianos was a play about three friends who find a copy of Schubert's song cycle Winterreise (I don't even know what song cycle *is*!) and decide to play it while re-enacting an imagined scene of Schubert hanging out with his friends at a house party. So I definitely wasn't planning on necessarily getting everything in the play but, given the strong work of pretty much everything A.R.T. does, I knew I would still have an enjoyable time. Three Pianos was a riot!! First off, upon entering the play, audience members are given a glass of wine (after all, it is a house party!). As soon as the play starts, and it starts fast and doesn't look back, the actors seamlessly transition between the present day and the imagined 19th century party. As someone who had no previous knowledge of the music itself, let alone the personal history of classical composers in general, the context behind each piece was brought up in such a fun way and interesting way that I now have a new found interest in music theory... I've actually started downloading lectures online! As for my more musically inclined friend, she thought it was great as well! In fact, because she knew more coming in, she picked up on a lot of details I missed. Oh, and did I mention that the wine keeps flowing during the play? Three Pianos is really smart and very, very entertaining. 1 Response to "Review: Three Pianos"
I used to love playing the schubert impromptus so I went to this as someone familiar with classical music. There were only maybe 2-3 truly comedic moments and I fell asleep in the first Act. And the "free wine" is 2 buck chuck.